Filcon is endeavouring to master the fine art of delivering outstanding customer service on a consistent basis. No easy task, as it requires hard work and discipline to accomplish, as top management pushes for “near perfection” in delivering service to the company’s customers. Filcon is a certified and audited ISO 9001.2008 quality managed company which ensures that the company does not just rectify errors and problems in a timely and expedient manner but goes a long way towards eliminating them. Filcon’s culture ensures that customers are treated fairly and with dignity, and that employees be both courteous and friendly, and that they have indicated their willingness to subscribe to a “Minimal Expectations” list. The sales representatives receive regular in-house training because there is a general lack of experienced people working in the filtration industry, so particular attention is given to improving the level of staff’s knowledge of filtration and the company’s products. Filcon represents a number of well know international filter manufacturers and distributes their quality filtration products which are imported from USA, UK, Germany, Italy, Taiwan (ROC) and PR China. Filcon believes that having custom made products in South Africa is very persuasive, because of the (small) size of the market here and the sheer range of filters that are available on the global market. It’s impractical to hold stocks of them all. So if a customer requires a filter that is in any way non-standard, we can deliver sooner and cheaper than importing. 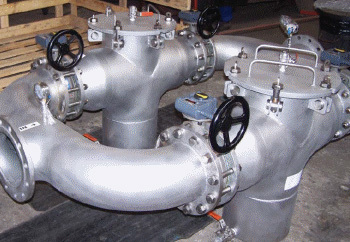 Custom manufacturing has been very successful, and the division has made a name for itself with some of its products particularly the DirtGobbla, a centrifugal separator that is currently unique in South Africa. Filcon is also known for its automatic purging strainers and back-washing strainers, as well as a popular range of in-line basket strainers. Filcon Filters has a reputation for being able to solve complicated filtration problems. Management’s philosophy is to position Filcon, not just as a seller of filtration products, but the provider of the clearest solutions.